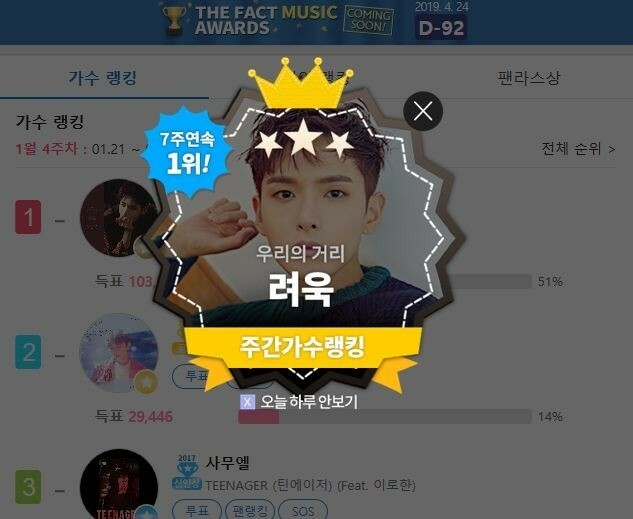 [THE FACT] Ryeowook of the group Super Junior has ranked first for seven consecutive weeks. Ryeowook ranked 1st by getting 254,050 votes in artist ranking in 3rd week of January from January 14 ~ 21 held by ‘FANNSTAR’. Followed by Hwang Chiyeul with 147,516 votes as 2nd, and followed by Kim Jaejoong with 86,180 votes as 3rd place. ‘FANNSTAR’ screens congratulatory video for the artists who have been in the 1st place for 5 consecutive weeks in Korea and in Shinjuku, Japan. Also, if the artists record 10 consecutive weeks of 1st place, they enter in Hall of Fame. ‘FANNSTAR’ also provides various benefits such as screening the impression video of the artists in displays located in Korea and Japan. Meanwhile, ‘FANNSTAR’ will be holding ‘THE FACT MUSIC AWARD’ at Namdong Gymnasium located in Namdong-gu, Incheon on this coming April 24th.